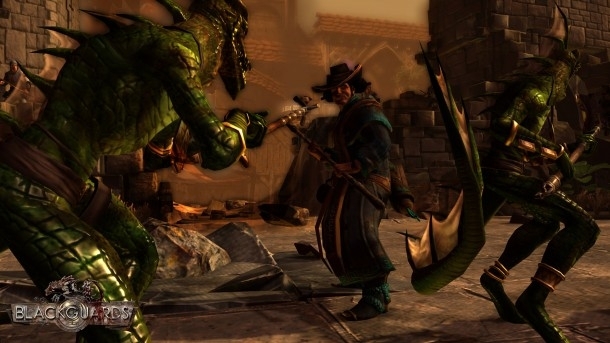 Blackguards is a strategy role-playing game developed and published by Daedalic Entertainment for Microsoft Windows. The game takes place in the world of The Dark Eye, which is Europe's most successful pen-and-paper role-playing game, outselling even Dungeons & Dragons and has been around for 27 years. What happens when the only hope of a threatened world lies not with heroes in shining armor, but is placed in the hands of a band of misfits and criminals? The player takes on the role of a convicted murderer who must use the help of a team of more than questionable characters to save the world from a dark menace. But when life and death are in the player’s hands, how far will they go to reach their goals? Blackguards is a turn-based strategy role-playing game that offers a lot of customization for the player. You take on the role of a character (player created) who is a convicted criminal, and must use the help of people with the same background to help save the world. When you begin the game, you have the option of creating a character that can select one of three different classes. While these classes offer different play styles, they are not set in stone and the player can fine tune them however they want. The skill system in Blackguards offers a deep customization that allows the player to fine tune their character's stats. As the player completes battles, they earn Adventurer Points that they can place into many different attributes and skills that will improve their character. Welcome to the walkthrough for Blackguards, which will guide you from the beginning of the game through and to the end.